Home  Uncategorised  Native Oysters, Rock Oysters, Mussels and Farmed Turbot, Valentine’s Specials from Direct Seafoods. 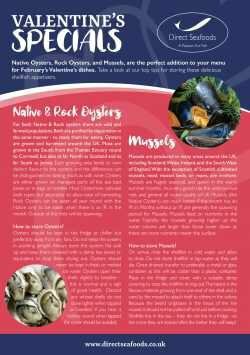 Native Oysters, Rock Oysters, Mussels and Farmed Turbot, Valentine’s Specials from Direct Seafoods. Native Oysters, Rock Oysters, and Mussels are the perfect addition to your menu for February’s Valentines dishes. Take a look at our top tips for storing these delicious shellfish appetisers and view our farmed Turbot feature from our supply partners – Stolt Sea Farms. Click here to view the full promotion.